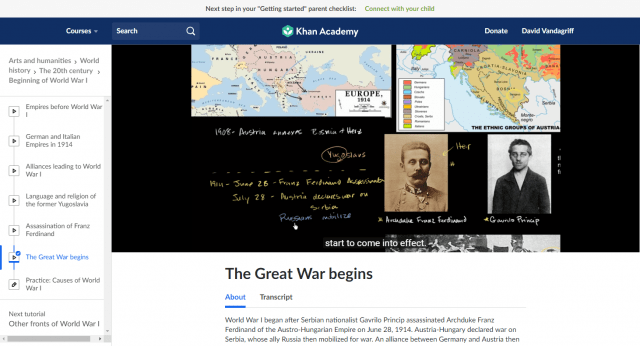 For those not familiar with it, The Khan Academy is a free online educational institution that provides courses on a wide range of subjects for students of all ages. It’s a great place to learn how to code in various computer languages. However, it also includes a variety of history courses. Below is a screenshot from a six-minute tutorial/introduction to one of their history courses discussing the beginning of World War I. Or you can view The Great War series on YouTube. Flo and Indie and the crew have broadcast thrice weekly episodes about the Great War every week since the centennial of its beginning; that is, since August 2014. They have produced hundreds of enlightening episodes. They also post to Facebook and Twitter. All this is free, but they are grateful for donations through Patreon. There is a lot out there for those of us who want to learn.